Eco-friendly, natural cat litter: what are the options? At zooplus we aim to offer our customers the best range of products; as we get more demand for eco-friendly and biodegradable cat litter and as more options become available from suppliers, we are keen to provide these choices to our customers. What are the options though and is eco-friendly cat litter as good as other cat litter when it comes to effectiveness and usability? Natural cat litter options are made from natural ingredients, often with little processing: this means that during and after manufacture they have less impact on the environment and they may be better for your cat too. If your cat suffers from allergies he or she may be better off with a natural kitty litter as these do not use chemicals to give the litter a scent or hide the odour. This doesn’t mean that eco-friendly cat litter fails to do this though: many are wood cat litters which retain a natural wood scent, with pine a popular material. Biodegradable cat litter can have advantages for you as a cat owner too. If you have allergies the current cat litter in your home could even be causing you problems that you blame on pollen or foods, and an eco-friendly dust-free litter may be better. It is also a lot easier to dispose of natural litter, for a start it is truly flushable with everything being biodegradable and non-harmful to the environment. The left over cat litter can be put into the compost too and will quickly biodegrade meaning less waste going to landfill. Wood based brands tend to be clumping litter too, making it even easier to separate clumps for flushing from left over litter to compost. Cat’s Best Öko Plus is up to three times more efficient than conventional clumping litter as the natural capillary-like structure of the tree fibre soaks up and retains moisture. Wood cat litter may not sound that eco-friendly but with pine especially it can be. Pine grows quickly and you can check that a wood based litter comes from a managed forest. 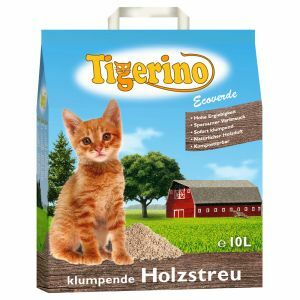 Tigerino wood based clumping cat litter comes from 100% renewable sources and you don’t have to use as much as with many cat litters while still achieving zero odour. Other eco-friendly cat litter options include those made from corn kernels. World’s Best Cat Litter sounds like a brand name from a company who may be a little over confident in their product but many customers agree that it really is the best: we have had many many positive reviews of this US brand of corn kernel based litter, which uses a natural additive to absorb odour. World’s Best Cat Litter is dust-free too so cats digging and scratching won’t lead to a cloud around them and what’s more even if your cat or kitten is silly enough to try and eat it, it is totally safe. At zooplus we are proud to also offer a hemp-based natural litter, Hugro Hemp Pellets , that is suitable for cats and other small pets and birds. It can last for up to 12 weeks and once in the compost bin will be completely composted in another eight weeks, making great top soil. Hugro Hemp Pellets are also pH neutral meaning even the most allergy prone cats shouldn’t have any problems. Lastly, we have perhaps the most eco-friendly litter of all: the Pet’s dream paper based pet litter, suitable for cats as well as other small pets. This litter is 100% recycled, 100% biodegradable and compostable meaning it has virtually zero impact on the environment; recycled paper is also highly absorbent. So how effective are these options then, well as we already mentioned with wood based litters the plant structure actually makes them very good at soaking up moisture and the odour of a natural product tends to be much more pleasant than an artificially created scent, which itself can be quite unpleasant. As for how long these biodegradable litters last, they seem to last as long, if not longer, than conventional silica or clay cat litters and long after artificial scents fade the natural smell of wood, hemp or corn remains. We’d love to hear from any of our customers who have had experience with these and other eco-friendly cat litter either in the comments or through our Facebook or Twitter accounts. This entry was posted in Cats and tagged best cat litter, cat litter, cat litter options, choosing cat litter, clumping cat litter, eco-firndly cat litter, kitty litter, natural cat litter, wood cat litter, world's best cat litter by zooplusuk. Bookmark the permalink.